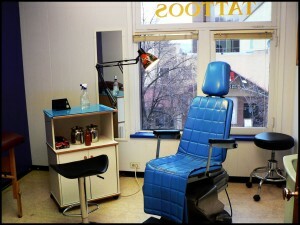 Very busy, well established and reputable downtown tattoo parlour for sale. Shop has been open since 2002 and is currently run by non-tattooing owners. Excellent opportunity to join part of a growing industry with no tattooing skills required. Also a great opening for a tattoo artist looking for a turn key operations, no sweat equity required. Sale includes all operational equipment, dental chairs, autoclave, stencil machine and office equipment/furnishings. All equipment is high quality and regularly maintained. Great foot traffic, in a great downtown location. COmpletely redone interior to include paint flooring and some electrical. Lease is transferrable with 1 year remaining. Monthly lease is $1130 plus HST and includes all heat, a/c and hydro. Financial available upon request. To view all businesses and properties for sale in Kamloops click here.